Being human means being susceptible to bias. When you think about humans as animals in the wild (which we pretty much still are, despite our fancy clothes and smartphones), it makes sense—our brains receive so much information at any given point in time that we can’t possibly take it all in. We have to take some shortcuts in order to avoid having complete mental meltdowns every few moments. But when it comes to making the best hiring decisions for your company, bias can actually do more harm than good. Our susceptibility to bias can unintentionally lead us to select people from certain groups over others, making us less likely to hire people from diverse backgrounds. This is why it’s so important to raise awareness of how bias can influence our decisions and take steps to reduce its power. 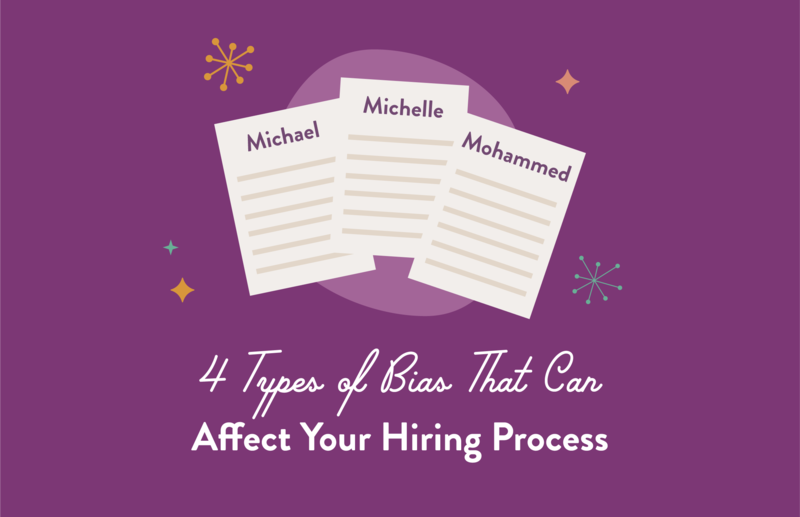 Here are a few of the most common types of bias that creep into the hiring process. Confirmation bias refers to our tendency to notice and remember information that validates opinions we already have, as well as our likelihood of forgetting or dismissing information that conflicts with our opinion. In other words, when we want something to be true, our brains will work hard to find information that “proves” that it’s true—and ignore any evidence that contradicts it. This can be problematic in the hiring process. Imagine a hiring manager who believes that their alma mater is the best and harbors a strong distaste for their rival school. Whenever they have the option to hire someone from their alma mater, they’ll focus on their good qualities (while ignoring any red flags) and they’ll dismiss candidates from the rival school by zeroing in on their negative attributes and ignoring their strengths. You can see how this could translate into a company that’s full of Sharks or Falcons (or whichever fierce mascot represents the manager’s alma mater). See “The Issue with the Interview: Confirmation Bias” to learn more about how confirmation bias affects hiring decisions. The similar to me bias refers to the fact that we get along with people who tend to look and think like we do. Research from Penn State finds that this tendency applies across different dimensions of similarity including values and habits, beliefs about the way things should be at work, and demographic variables such as age, race, and gender. This bias has serious implications for hiring, too. If you don’t take measures to overcome similar to me bias, you may find your company is a lot more homogeneous than you’d like. And this is a surprisingly common occurrence: Namely’s Workplace Diversity Report 2018 found that people are more likely to have a manager of the same ethnicity and gender. Since managers tend to be the primary decision-makers when it comes to hiring, this could be evidence of similar to me bias coming into play. For many years, companies may have been unwittingly perpetuating similar to me bias by assessing candidates on something called “culture fit.” Culture fit, also sometimes called “the beer test,” often referred to a hiring team’s assessment of whether they’d enjoy getting a beer with a candidate after hours. As people have become more aware of similar to me bias, the focus has shifted from “culture fit” to “culture add on” or “job fit.” Rather than imagining whether they’d like to get a beer with someone, hiring teams are encouraged to look for a person whose values are aligned with the company’s. For more on this topic, see "What’s the Difference Between ‘Culture Fit’ and ‘Job Fit’?" There have been a number of studies showing that women and people of color are less likely to be hired. One study published by Harvard Business School found that statistical discrimination, which is “rooted in beliefs about average gender differences in abilities or skills,” works against women in the hiring process. Other research, published in Harvard Business Review, found that white applicants received an average of 36% more callbacks than black applicants and 24% more callbacks than Latino applicants with identical resumes. Another study by Yale University found that a hiring team would say they valued education over experience when a male candidate had a stronger educational background, but then change their opinion to say experience was more important when the male candidate had more experience. They’d completely switch their priorities in order to hire a male candidate! The good news is that when they agreed on the hiring criteria ahead of time, they would hire the candidate who best fit the qualifications, regardless of their gender. With the increase in on-demand video interviews, employers now have the ability to assess candidates on certain aspects of their personalities without even meeting them in person. This type of on-demand video interview saves employers time and resources when evaluating candidates on traits like extraversion and conscientiousness. However, video interviewing can’t detect the full spectrum of Big 5 personality traits (conscientiousness, extraversion, agreeableness, neuroticism, and openness to experience). This means that we may unintentionally be over-enthusiastic about enthusiastic candidates, giving preference to those with high extraversion. This can be problematic, because extraversion is not always a valid predictor of job performance. Research by Barrick & Mount (1991) found extraversion to be a valid predictor of job performance for occupations that involve social interaction like managers and sales roles, but not a valid predictor of performance for other roles. This makes sense—different jobs require different skill sets. You don’t always need every employee to be highly extraverted. There’s a place for introverts in the workplace, too! This list is by no means comprehensive—we’ve just covered a few of the most common types of bias that impact our hiring decisions. By examining what these biases are and how they might impact your decisions, we hope we’ve given you some food for thought. There are a number of steps you can take to limit the effects of bias, including articulating a clear list of qualities you’re looking for before you begin the hiring process and assessing all candidates against the same criteria. Melissa Suzuno is a freelance writer, editor, and content marketer who enjoys exploring the intersection of people and work. Find Melissa on LinkedIn and Twitter.